Senior captain Wade Megan has signed an amateur tryout contract with the Florida Panthers’ AHL affiliate in San Antonio, where he could begin his pro career tonight. The left wing, who finished his BU career with 79 points (47 g, 32 a), had been a Panthers fifth-round draft pick in 2009. UPDATE Megan scored his first AHL goal last night in San Antonio’s 4-1 win against Grand Rapids. Ten minutes into the first period, Megan took a pass at full speed—“coming down central” as Bernie Corbett would say—and wristed the puck home for the game’s first goal. It was his only shot of the game, but earned him third-star honors. Senior center Ben Rosen has signed an amateur tryout contract with the Bridgeport Sound Tigers, the Islanders’ AHL affiliate. He joins former BU netminder Rick DiPietro on the Bridgeport roster. ● Mike Eruzione: “Congrats to David Quinn as New BU hockey coach. Great recruiter, coach and person. A new era starts now. 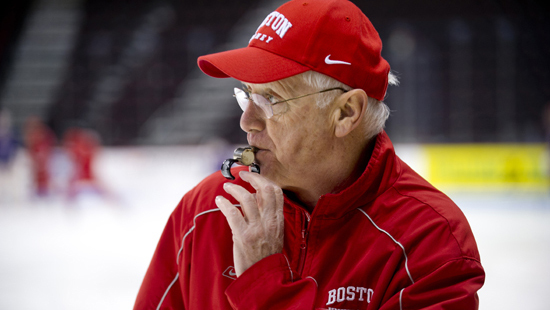 BU Today examines another part of retired coach Jack Parker's legacy: the dozens of his former players now coaching at a variety of levels from youth hockey to USA Hockey to college and the professional ranks. Former Terriers John Hynes and Ken Rausch share their thoughts on how Parker's influence has shaped their coaching careers. BU Today also produced a slideshow covering the nearly 50 years of Jack Parker's association with Terrier Hockey, beginning as a freshman in 1964. Included are photos of Parker with many of the standout performers he coached including numerous players who have gone one to coaching careers. Alex Chiasson was ranked #7 among Dallas prospects. Terriers have added defense corps depth for next season with recruited walk-on South Shore Kings blueliner T.J.Ryan. A 5-11, right-shot from West Newton, Mass., TJ is the son of former BU defenseman Tom Ryan, who currently provides analysis on WWZN broadcasts of BU Hockey. TJ. was a three-sport athlete at Newton North High School, playing lacrosse and golf as well as hockey, was a five-time captain and earned recognition as the school’s top male athlete. He switched to forward in his first EJHL season, but returned to defense this past season, scoring eight points in 43 games with the Kings. In a bit of serendipity, the elder Ryan shared the captaincy of the 1987-88 Terriers with BU’s new head coach, David Quinn. Chiasson’s 13th goal of the season, three minutes into overtime, gave AHL Texas a 7-6 win against Houston. The two-time Ed Carpenter Award winner while at BU also added an assist. He had been called up to Dallas last week, but was returned to the AHL club. Corey Trivino’s hat trick led the Florida Everblades past Orlando, 8-3 The former Islanders draft choice has 16 goals and 32 assists in 60 games.